The path of the north celestial pole across the sky as it circles around the ecliptic pole every 25,772 years due to the precession of the equinoxes. The precession of the equinoxes is a gradual changing in the direction of the Earth's rotation axis, which causes the position of the celestial poles to drift through the constellations at a continuous rate of roughly 20 arcseconds per year. Although this effect is small on short timescales, the accumulated drift adds up to about one Moon diameter per century. Currently the Earth's north celestial pole points close to the star Polaris, but this will not always be the case. By 2500, Polaris will be several degrees away from the true celestial pole. A conventional planisphere is a simple hand-held device which shows a map of which stars are visible in the night sky at any particular time. By adapting the design of the planisphere, it is possible to build a similar instrument which, instead of demonstrating the rotation of the night sky around the celestial poles, instead demonstrates the movement of the celestial poles due to the precession of the equinoxes. On these web pages, you can download two models of planisphere for demonstrating the precession of the equinoxes. One shows the effect of the precession of the equinoxes on the northern sky. 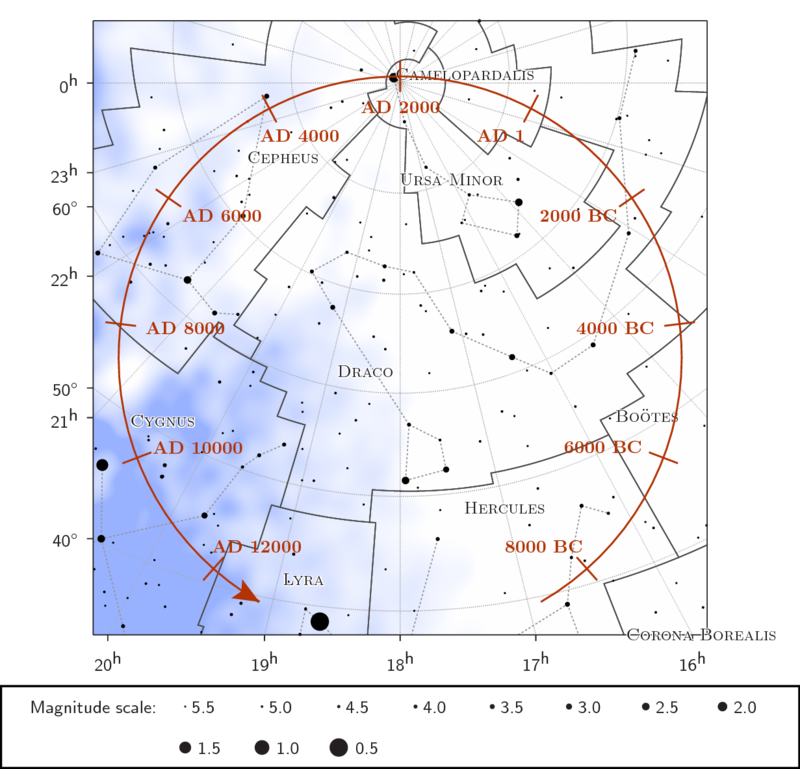 Specifically, it shows the precession of the north celestial pole through the northern sky. The other shows the effect of the precession of the equinoxes on the southern sky. When a gyroscope spins at a slight tilt to the vertical, the Earth's downward gravitational pull causes the gyroscope to turn in circles around the vertical. This motion is called precession. The same effect also acts on the Earth as it spins: the Sun's gravitational pull causes the Earth's polar rotation axis to rotate slowly around the direction perpedicular to its orbit around the Sun. This direction is called the north ecliptic pole. Diagram courtesy of Lucas Vieira Barbosa. If you have any transparent plastic to hand, e.g. acetate sheets for use on overhead projectors, you should print the right ascension / declination grid onto a sheet of plastic. If you do not have any acetate to hand, don't worry – your planisphere will work fine without it! Step 6 (Optional) – If you printed the right ascension / declination grid onto a sheet of plastic, you should now stick this grid of lines over the viewing window which you cut out from the body of the planisphere. Congratulations, your planisphere is now ready for use for demonstrating the precession of the equinoxes! 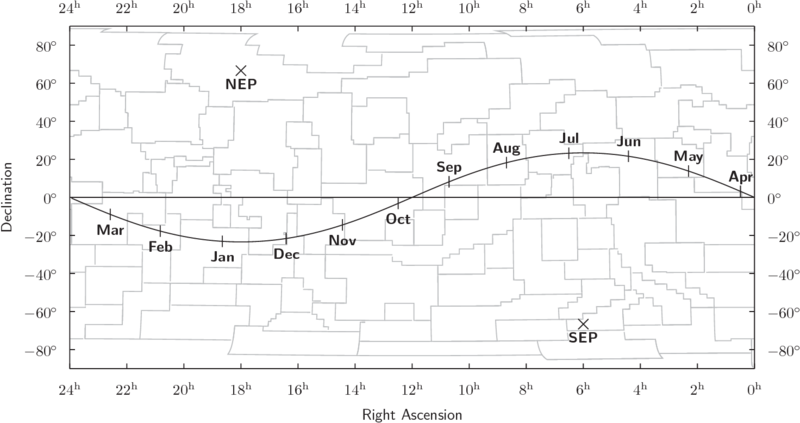 The positions of the north and south ecliptic poles, projected onto a rectangular map of the constellations in right ascension and declination. The north celestial pole is at the top, and the south celestial pole is at the bottom. The ecliptic poles lie in the constellations Draco and Dorado. On this special design of planisphere, the sky is projected onto the star wheel with the north ecliptic pole at the center. The grey lines marked onto the transparent plastic window mark the right ascension and declination of the stars behind. As the star wheel is rotated, the position of the north celestial pole turns in circles around the ecliptic pole, simulating how the celestial coordinates of stars change over time due to the precession of the equinoxes. Turn the star wheel until the arrow on its edge lines up with the scale of years marked around the top of the planisphere. The viewing window will now show all of the stars in the celestial northern or southern hemisphere in this year. You can read off the changing celestial coordinates of stars over time using the grid of lines of constant right ascension and declination marked onto the transparent plastic window.